The Nikon AF-S DX Nikkor 18-105mm f/3.5-5.6G ED VR is a very decent performer for a kit lens, especially if you consider its fairly large zoom ratio (it's an almost 6x zoom after all). Centre sharpness is impressive at all focal lengths, wide open or stopped down a notch, allowing you to utilise the resolution potential of any currently available Nikon DX camera including the D5100 and D7000. The corners and extreme borders can be noticeably softer, especially in the telephoto range, but they do sharpen up quite nicely upon stopping down to f/8 or f11. The bokeh is surprisingly nice for a zoom. The lens is moderately susceptible to flare and quite prone to geometric distortion (barrelling at the wide end, pin-cushioning in the telephoto range) and chromatic aberrations. The latter two flaws can, however, be dealt with quite successfully in-camera or in post-processing. You'll also notice some light fall-off in the image corners when you use the lens wide open, especially at the two extremes of the zoom range. Build quality is decent despite the extensive use of plastics in the lens' construction, down to the lens mount. The zoom ring is very wide, comfortable and smooth in action, but the focus ring was not to our liking, with its rather limited “travel” making it hard to nail focus perfectly. Auto focus, on the other hand, was very accurate (and quiet) if a little slower than you'd expect from an AF-S lens. The internal focusing mechanism makes the use of polarisers and graduated neutral density filters easy, as it keeps the filter thread from rotating on focus. The VR system allows the use of shutter speeds that might otherwise result in blurry photos, although it does not feature the Active VR mode found on some more expensive VR lenses. The inclusion of a petal shaped lens hood and lens case is very nice at this price point. If you are contemplating whether buying your next Nikon digital SLR camera in a bundle with this lens is a good idea, the answer is yes. 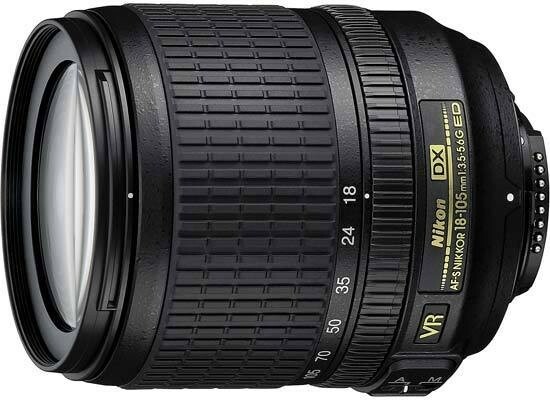 The Nikon 18-105 VR is a really good all-rounder that does most things very well, even if it's not without faults. Adding an inexpensive 35mm f/1.8 or 50mm f/1.8 lens to your kit for low-light work might still be a good idea if you're worried that the 18-105's relatively slow maximum aperture may limit its utility for that kind of photography, but apart from that there will be very few cases when you'll want to put a different lens on your camera. Now, if you already own another DX standard zoom, the answer is not so clear cut. While the 18-105mm does have more telephoto reach than some other kit zooms, buying a dedicated telephoto lens such as the 55-300mm f/4.5-5.6 VR may make more sense for those that already have a standard zoom of some kind.